At the same point in time, and adjusting for seasonality the iPad is outselling the iPhone by a factor of 3 and the iPod touch by a factor of about 5. This is also reflected in the installed base of devices, where the 84 million iPads sold through its first nine quarters is more than three times the iPhone base at a similar point in time. Of course, the world of 2012 is different than the one from 2009 when 25 million iPhone sold. iPhones are available in far more points of sale and to many more buyers world-wide. But the interesting contrast is between the iPad and the iPod touch. I’ve always maintained that the dynamic difference between the iPad and the iPhone is that it’s unrestrained (and unsupported) by the operator channel and all that it implies. The iPad is a pure computing product whose means of communication is unregulated. That means transparency in pricing and transparency in distribution. But so is the iPod touch. The iPod touch is a “nano iPad” (or as detractors put it, the converse of that.) So shouldn’t the iPod touch behave as the iPad? We don’t know exactly how the iPod touch behaves. We don’t have specific figures on its sales. 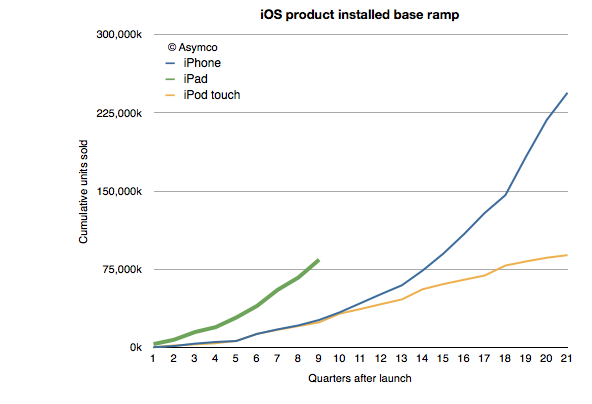 What you see in the charts above are my estimates for the iPod touch based on company statements that “about/above 50%” of iPods are touch versions. That and the cumulative sales totals that are occasionally reported. However, we have received an unexpected morsel of data from the Samsung v. Apple trial that may help characterize the two products: US sales data. Having the US data and knowing/estimating the global data gives us an estimate of the international (ex-US) sales for all three products. 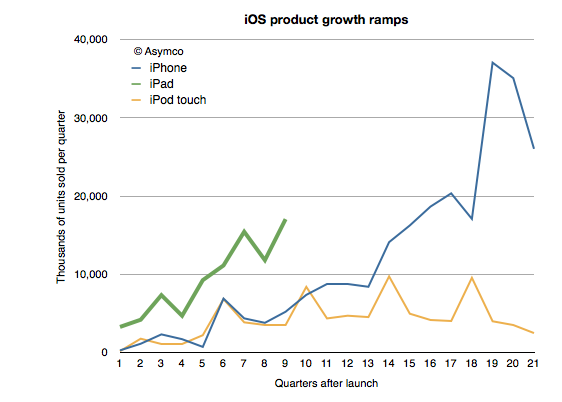 I indexed the three products to measuring quarters since launch. The pattern here is that the iPad diverges from the iPod touch in its international appeal. Since the iPad expanded internationally even faster than the iPhone, the issue is not only one of rapidity in appeal but also a qualitative difference. 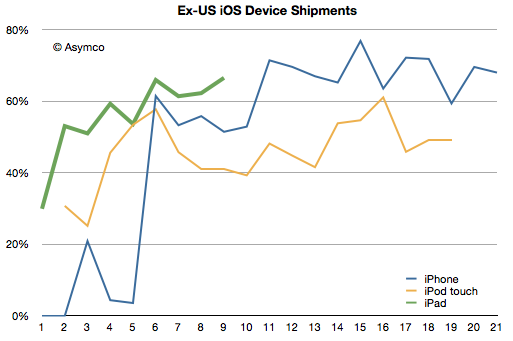 The iPod touch seems to have stabilized at 50% non-US sales while the iPhone is between 60% and 80% outside the US. The iPad reached 60% non-US sales in its first year. Its last quarter was 70% outside the US. The characteristic value of the iPad is in its appeal to “computing non-consumers”. Computing has come to mean media consumption, education, communication and entertainment. These jobs to be done are casually done with much more ease on an iPad. The iPod touch can do these jobs as well, but not as comfortably. The iPod touch is “absorbable” by younger consumers and typically they have their hiring done by their parents. Those parents are less likely to indulge where incomes are lower. But the universal appeal of the iPad is evident in its global visibility. Like the tasks it performs, the iPad itself is becoming less of a mystery. ‹ Previous Post Are Apple stores overstaffed?